Marijuana was officially Decriminalized in NH Nearly 6 Months Ago: Has the Law Changed Anything? Last month, a limited legalization bill was passed in New Hampshire, allowing adults to possess up to three-quarters of an ounce of marijuana. The bill also permitted the cultivation of up to six marijuana plants, three of which could be mature. It would be legal to possess an amount of marijuana in excess of the allotted three quarters so long as it was stored with the plant that produced it. This bill, passed in a 207-139 vote, overturned the decision of a House committee that had recommended against its passage last November. The bill had since been amended and subsequently passed. A commission is still weighing the possibility of legalizing retail sales of the substance. The University of New Hampshire published four consecutive polls that showed at least 60% of state residents were in favor of legalization. The recent limited legalization bill follows the marijuana decriminalization that took effect with HB 640 last July. Under that provision, the possession of less than three-quarters of an ounce was no longer a criminal misdemeanor, rather a civil violation for which the state could only impose a fine. The measure, however, was limited in scope. In practice, it has not made much of a discernible difference. Should someone possess even slightly more than the allotted three quarters, they would still face misdemeanor charges. New Hampshire’s Union Leader drew attention to this shortcoming by showing two nearly identical bags, filled with oregano in place of marijuana, with a very minute difference in the volume of their respective contents. One was labeled “violation,” the other labeled “misdemeanor.” The police were tasked with eyeballing which was which. 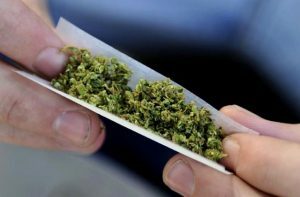 The three-quarter limit is meant to provide some ‘leeway’ for personal use of the drug, although those who were found in possession would still be subject to a fine of $100, payable by mail, for first and second offenses, and $300 for subsequent offenses over a three year period. A fourth offense becomes a Class B misdemeanor. The fine for one single offense can be waived if the perpetrator completes a substance abuse assessment. In sum, despite the perceived “relaxation” of marijuana law after its limited decriminalization, only a narrow set of marijuana-related offenses benefit from the decriminalization. In addition, those who were arrested before the law took effect last September were still retroactively subject to the state’s marijuana laws prior. One concrete change was the newfound inclination for prosecutors to reduce misdemeanor charges to a violation, which would in turn “result in less time and resources spent on such cases, allowing police and courts to spend more time and resources dealing with serious crimes,” according to Judge Edwin Kelly. A disinclination to view marijuana possession as a serious crime in need of harsh prosecution begs the question of why resources were spent to criminalize it, to begin with. In the wake of decriminalization, the three-quarter limit will no longer constitute a violation, but charges will still arise until the drug is fully legalized in the state. If you are charged with marijuana possession in excess of three-quarters of an ounce in New Hampshire, do not hesitate to contact the experienced NH criminal defense lawyers at Tenn And Tenn, P.A. Tagged: Criminal Defense Lawyers in NH, Possessioin Of Controlled Drugs and Pot Possession in NH.